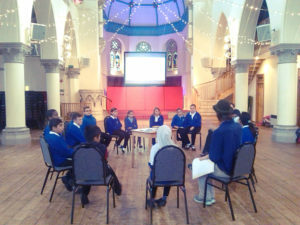 Proud2B exemplifies Salaam Shalom’s focus on encouraging dialogue from an early age and also helps informs children of what it means to be Muslim or Jewish. 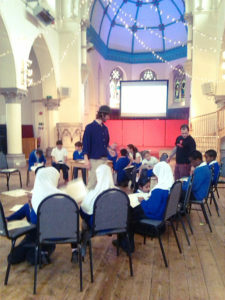 Proud2B was developed to encourage dialogue between children of Primary School age and explore a range of cultural backgrounds within their own and other communities. 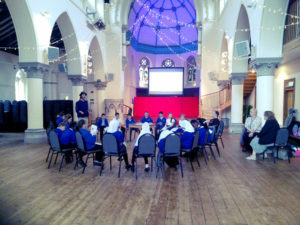 Pupils from individual schools simultaneously spend at least two classroom sessions exploring their own culture and identity. 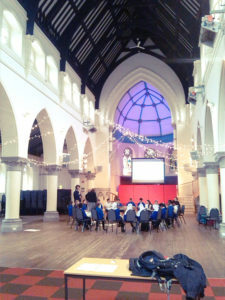 Schools participating in the project are generally chosen for their students’ different ethnic and cultural backgrounds – often one with from an inner city catchment area and one from an outer area. 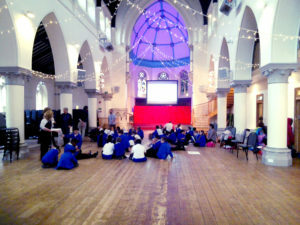 This stage includes drawing pictures, writing poems and creating short videos. 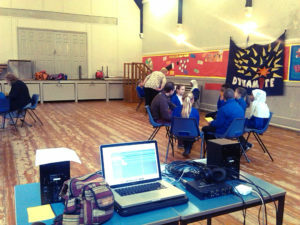 After working separately, the two sets of primary schoolchildren come together in a longer session to produce a podcast – originally these programmes were created in the Salaam Shalom radio studio, giving them the additional experience of being ‘On Air’. As technology has developed, and with the studios no longer in existence, mobile devices and editing tools can be used to equally powerful effect. 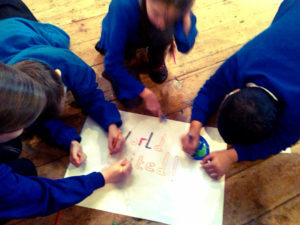 One set of early Proud2B art work, podcasts and video films became a Bristol MShed exhibition. 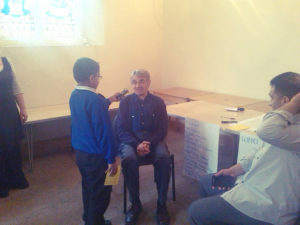 Because Salaam Shalom understands the constraints of time, curriculum and resources, a ‘lite’ version of Proud2B has been developed, with a single class, each from two schools, spending a single school day participating in three continuously running workshops: art; music; media interviewing. 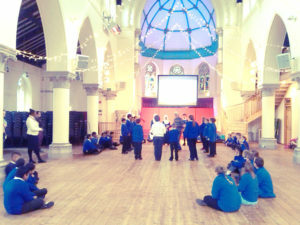 Each workshop ensures a mix of students from the two schools. 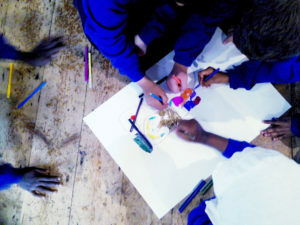 Art – pupils start by individually making a drawing placing themselves at the centre of their family, school and community life. 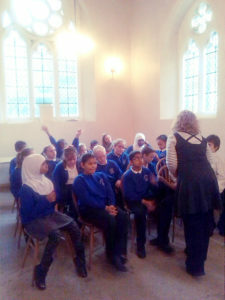 They then share this with a workshop neighbour from the other school. Talking to each other the intention is to learn listening and dialogue skills to learn what they have in common, as well as where their lives differ as well as identifying similarities. 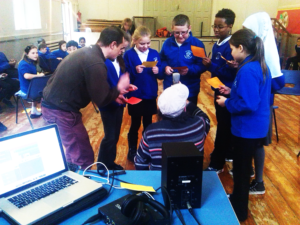 Music – pupils work together to write the words and music for a song about living in Bristol. Sharing perceptions similarly laid bare life events in common. 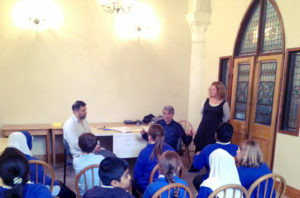 Interviewing – Pupils are given the opportunity to interview a Jewish and Muslim adult, experienced in encouraging positive questioning. 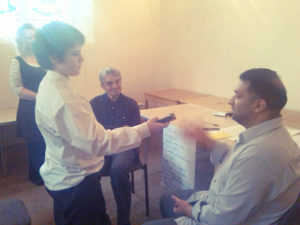 Before their arrival, pupils are given a short course in media interviewing skills and question writing. 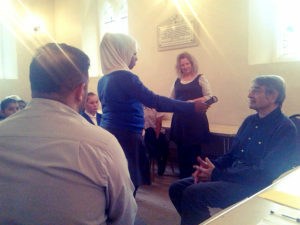 The interviews are designed to demonstrate similarities between Jewish and Muslim ways of thinking, believing and religious observance.